I've been so thrilled to experience the recent boom in street food in Stuttgart. Ever since the first (slightly unfortunate) event back in May, it seems organizers have been trying hard to learn from past mistakes and make these kinds of festivals worthwhile. I've been particularly impressed by the recent Street Food Thursdays in the Karlsplatz. If you follow me on Facebook, you've probably seen my photos from the past couple of Thursdays, which have offered more craft beers, more vegan and vegetarian options, and more international cuisine. 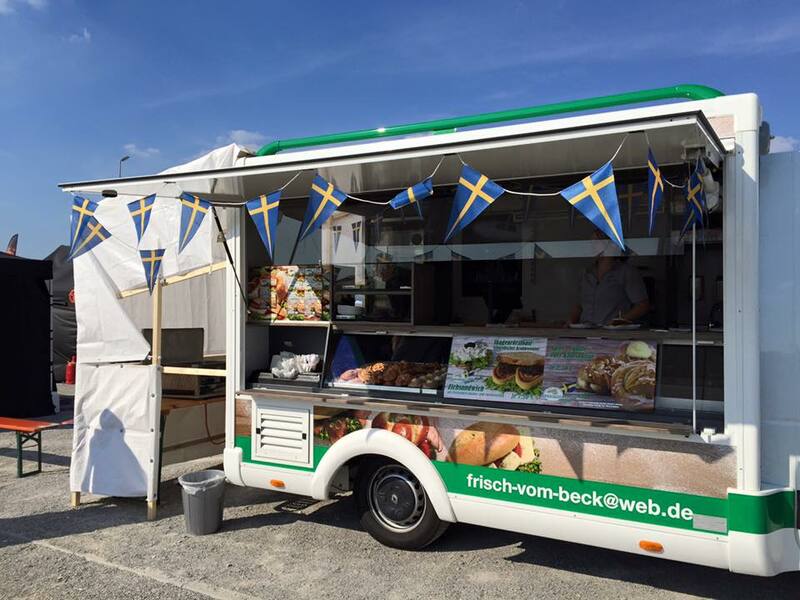 In fact, Facebook is how I first heard about the Street Food Festival in Böblingen-Sindelfingen. They've been posting teaser photos for months, so I knew this weekend's festival was going to be good. Unlike past events, they extended the festival to cover three days, helping to prevent a rush all on one day. They also charged a 3€ entrance fee. Now I know that they can be controversial, but I understand the need when you have to cover costs like trash cans, security, and toilets. And although the festival was a 20-minute ride on the S-bahn from the city center, it was located in the spacious "airfield" right next to the station. We decided to go as soon as they opened today (Saturday) just in case there would be huge crowds. We left Stuttgart's main station at 11:35 and got to Böblingen on the S1 at roughly noon. I wasn't entirely sure where to go, as I'd never been to the Flugfeld (airfield) before, but we just followed the sign out from the station and found the festival easy enough behind the Motor World. We paid our entrance fees (Leo was free, of course), received a blue stamp so that we could come and go as we pleased, and entered the field. The area for the trucks was huge. I'm not sure how many there were, but the organizers said there were over 40 on their Facebook page. Of course our first move was to make our round and check out all the different vendors. Many of the food trucks were still prepping their food and fixing up their tents. The lines, where we saw any, were only one or two people max at most places. It was so nice not to be shoved through a crowd like at the first street food festival in Stuttgart, and I felt like we could really take our time and wander a bit. We saw American pulled pork, German Bratwurst, Brazilian tapioca dishes, Latin American arepas, fried Polish pierogis, fried grasshoppers (yes, you read that correctly), burgers, hot dogs, corn dogs, ice cream, French crêpes, burritos, fish sandwiches, and much, much more. The first stall that caught my attention was Honolulu Dogs based out of Berlin. They had four very different kinds of hot dogs on offer that looked amazing! After much deliberation, we decided to go with the Sweet & Spicy Hot Dog with a papaya-mango salad, sriracha mayo, and roasted cashews. The dog was messy but so, so good. I think the meat, which was clearly homemade and lighter like a Nürnberger Bratwurst, had a bit of curry flavoring in it and was lighter in flavor than your traditional Bratwurst. This allowed the sriracha mayo to really shine next to the sweet salad and crunchy cashews. After having our hunger only slightly assuaged, we decided to go next door to Comptoir du Cidre where we saw a couple walking away with a gorgeous looking open-faced Cider Steak Sandwich. As my husband was waiting in line, he found out that both Comptoir du Cidre and Honolulu Dogs are owned by the same parent company in Berlin. The steak they were preparing had been marinated for 24 hours in cider, cooked for 11 hours sous-vide, seared on a grill pan, placed on toasted bread, and topped with onions that had been caramelizing for 30 hours, sautéed mustard seeds, and a pan sauce. It was out of this world! The meat was exceptionally tender and juicy, and the sauce and mustard seeds were subtle enough to compliment it without being overwhelming. True, it was 6€ for a small portion, but the quality was well worth it. 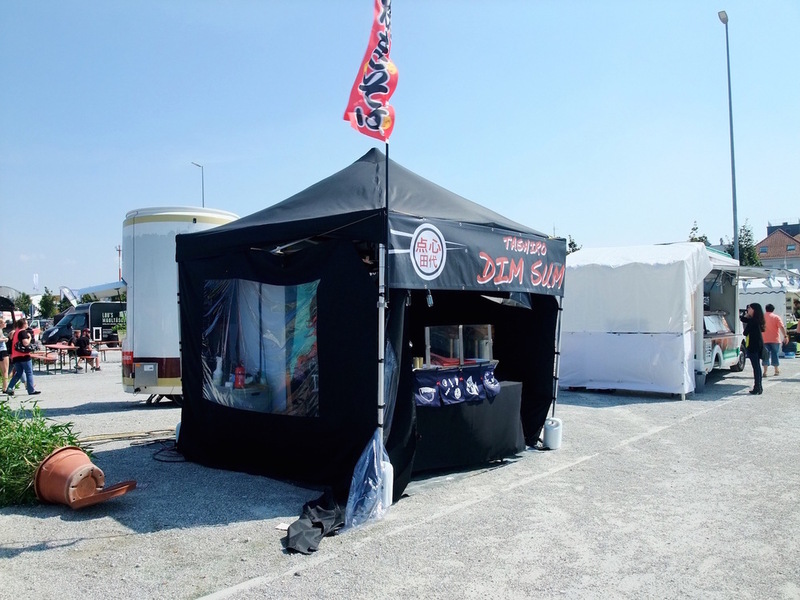 As we wandered around, I also saw some of the stands and trucks from the past two Thursday festivals in the Karlsplatz, including Tashiro Dim Sum (from Nipponnoodles in Munich), Fisch Futter and Poushe Strudelhaus from Austria, and Peruvian Brothers from a small town in Baden-Württemberg. Though I had some great dishes there, we decided to try a few more new items this time. Our next stop was at J. Kinski from a little town in Thuringia. A friend tried one of their sandwiches at last Thursday's market, and it looked delicious. Of their three choices, we went for The Fat Frenchman, a sandwich made on their homemade bread with "200 hour" beef, coleslaw, bacon-onion jam, arugula, and truffle mayo. I wish I could have eaten two! The beef had the consistency of pulled pork, and the bacon-onion jam and subtle truffle flavoring in the mayo blended well to make another messy, but extremely mouth-watering sandwich. We continued to power through lunch with our fourth dish coming from Maria Maria Arepas, another food truck from Berlin. I'd never eaten an arepa before today, and I was fascinated watching the chef fashion the corn dough and cook the patties on the griddle. I chose the Chorizo Arepa with beans, guacamole, lettuce, and a spicy tomato sauce. Personally, I think it could have used a bit more heat, but we really enjoyed the Mexican-style chorizo that we have not been able to find yet in Stuttgart. The bunch of fresh cilantro that the chef added to the top of our sandwich was also a nice touch. Finally, we decided it was time for dessert. We thought it best to not entirely gorge ourselves and went for two. The first was Salted Caramel Ice Cream from Claus, which I found out is based out of Stuttgart. They had lots of really enticing sorbets, like watermelon and lemon-basil, but we chose to go for the salted caramel. It was rich and creamy with the right amount of salt -- very good. I'll definitely hope to try more from them in the future! Our second dessert was a Swedish Vanillebullar from Bäckerei Springmann, also based in Baden-Würtemberg. I'm not terribly familiar with Swedish desserts, but I want to try more now. The Vanillebullar was a bit like a fried donut or beignet rolled in sugar and topped with a vanilla custard. My favorite thing about it, though, is that the dough had tiny flecks of cardamom throughout, giving the flavor a subtle, warm spice and putting it ahead of other fried doughnuts. We debated about whether or not to also try the beignets, but decided not to stuff ourselves uncomfortably. By this time, we'd been at the festival for about two hours and though the field wasn't crowded, the lines were getting to be five and six people deep at several trucks. We decided to call it day, and headed back to the train station. Overall, I think this was the best local street food festival I've been to yet. I loved the variety and especially the quality of the food on offer. After reading some of the comments/reviews on Facebook, I can see that many people aren't happy with the entrance fee and the expense of the dishes (most were around 6-7€). However, while I would have agreed with them at the second street food market where most of the stalls were really restaurant catering services and not actual food trucks, I was more okay with the expense today when there were actual food trucks from all over Germany with some really innovative dishes to offer. I really hope that this event organizer decides to do this again next year despite the naysayers. 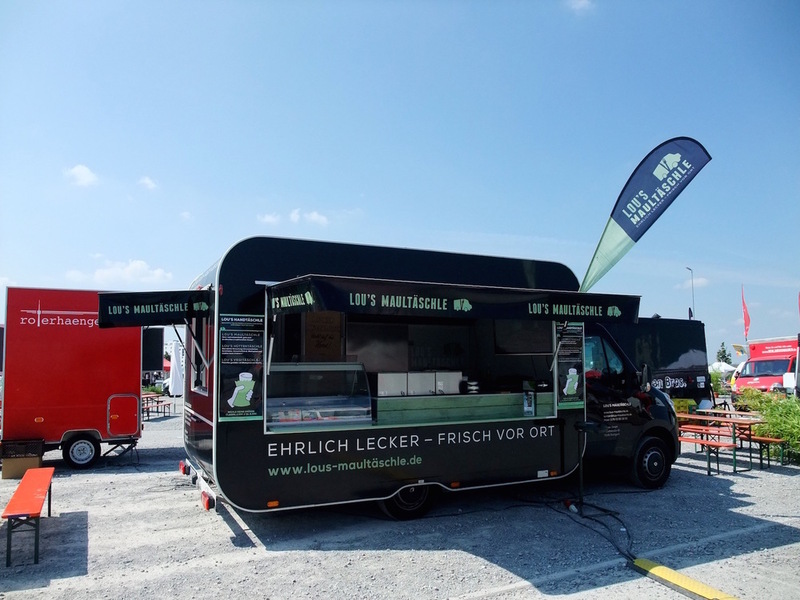 I also hope that the small street food market in the Karlsplatz on Thursdays will be able to attract several of these food trucks as they become a bit more well known. Tomorrow is the last day for this event this weekend. Do try to go if you're at all tempted -- you won't regret it! If you've already been, I'd also be curious to hear what you thought. Please leave your impressions in the comments section below!